1. Frankness or sincerity of expression; openness. 2. Freedom from prejudice; impartiality. The Candor Gallery Widget provides artists and viewers alike with a rotating display of artwork which is submitted by their peers. Candor Gallery offers an always changing source of inspiration as well as exposure for artists of all types. Participants are encouraged to submit any type of work: Painting, Design, Drawing, Photography, Sculpture, etc. Viewers can always learn more about the artist and his or her work by clicking on the image which will launch that particular artist's website. The entire Candor Gallery collection is now available for online viewing in the archive. Feel free to browse through all the pages. You may also view the most recent submissions to Candor Gallery. Version 1.2 of the Candor Gallery Widget features a previous button so you can easily look back at the last work that was displayed. This version now displays a different image each time Dashboard is activated. No more refresh time limits. Download the latest version of Candor Gallery. Candor Gallery Widget version 1.21. For you non-Mac folks, Candor Gallery is now available as a Google Gadget viewable on your Google Homepage. To add Candor Gallery to your Google Hompage, click on the "Add to Google" button. Know when new works are posted. Subscribe to the Candor Art Feed. You may also subscribe to the Candor News feed. may be sent to curator@candorgallery.com. To display your work on the widget, simply upload your images on the submission page. View the entire Candor collection online in the Archives. You can follow us on Twitter and be alerted of new works as they are submitted. We'll also post show dates. Feel free to contact us if you would like your show or work posted. An archive has been built enabling permanent links to artists' works. 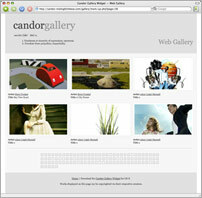 The Candor Gallery Widget receives over 115,000 views per month! Thank you to all those viewers and to all of you submitting art. Thanks to Apple for featuring Candor Gallery on their Widget page! Thanks to Digital Art Print Gallery for the Candor Gallery write-up. You can now follow Candor Gallery updates on Twitter. Thanks to everyone for their continued support. We continue to add new images on a weekly basis. Thanks to scannography.org for all the great submissions! We just wanted to say thank you to everyone who has been sending in work the last few days. We've received a large number of submissions and we're working hard to get all of them posted to the widget as well as the online gallery. Thanks to Apple for featuring us on the Dashboard home page and thanks again to everyone who has continued to submit artwork. We will be posting as much work as we can each day!